Bumblebee Lane is the first in a new book series called "The Quilted Prairie". 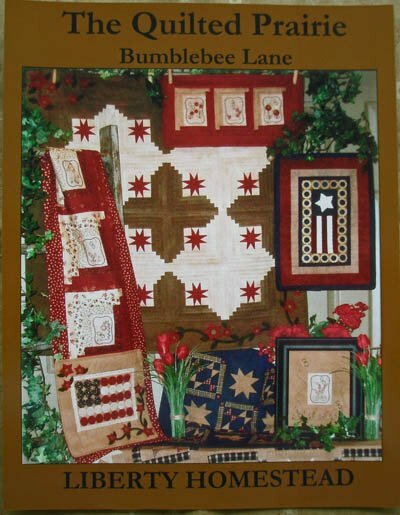 This book has a little bit of everything - a wool penny flag banner, a yo-yo flag banner - a wonderful pieced & quilted wall quilt - pieced and tied wall quilts - and, of course, embroidered bumblebees flying all around an adorable wall quilt, matching table runner, banners, & a quick & easy framed piece. There are projects from large to tiny using a variety of techniques & fabrics. Whether you're looking for a project for your own home, or trying to get ideas for that gift-list you're working on, there's sure to be something for everyone in here. This 44 page book is spiral bound and features 13 projects.